Australia’s largest provider of recreational boat insurance, Club Marine, has announced a partnership with group tour specialist, Ticket2Ride Global Adventures, to present the Club Marine America’s Cup Tour in 2013. The tour will put participants right in the heart of the action as the two rival America’s Cup teams join battle on the spectacular and beautiful amphitheatre that is San Francisco Bay for the 34th running of sailing’s premier contest from September 7 to 22 next year. The format for America’s Cup 2013 promises to be the most exciting, dynamic and action-packed ever, with giant 72ft high-tech catamarans clashing in head-to-head encounters that will see both craft pushed to their limits as teams race on a razor’s edge. It will be a contest pitting the world’s most advanced racing yachts and most experienced crews against each other for yachting’s most sacred prize. And all the action will be right on the doorstep of one of the world’s most beautiful and welcoming cities. While there may not be an Australian team in next year’s Cup final, there is a strong Aussie connection, with accomplished Australian sailor James Spithill skippering for the defending Oracle Team USA. There are also likely to be many other prominent Australian sailors involved, once both the defending and challenging teams have been announced. Club Marine CEO, Greg Fisher says he is delighted to announce the tour. 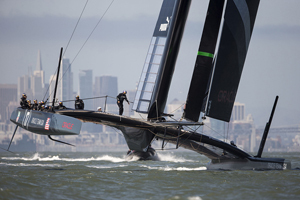 "The 2013 America’s Cup promises to be the most exciting yet. The level of anticipation and the excitement of the lead-up regattas have been unprecedented," said Fisher. "We believe the tour is a great opportunity for Australian and New Zealand yachting and sporting enthusiasts to witness one of the world’s iconic sporting contests at one of the world’s most spectacular cities." San Francisco is a city known for its diverse and welcoming culture. It is a city rich in history, boasting beautiful architecture and an eclectic and artistic population. It also rests on one of the world’s most iconic harbours, framed by the beautiful Golden Gate Bridge and offers many other famous attractions, including world famous Fisherman’s Wharf and the daunting former island prison of Alcatraz. And in September 2013, this will be the scene for one of the most enduring contests in world sport. The Club Marine 2013 America’s Cup Tour will include special features, such as a welcoming reception hosted by leading sailing identities. The tour also aims to present a couple of surprise highlights that will be announced as the tour departure date gets closer. And in addition to being right next to all the racing action, tour members will also have the opportunity to explore other exciting attractions in and around San Francisco, including a special tour of Alcatraz, a walk across the Golden Gate Bridge, and a day tour to one of the world’s most spectacular natural attractions, Yosemite National Park. There will also be a day trip to the charming seaside town of Monterey and nearby Carmel, with other exciting tour features to be announced. All dates and inclusions are based on current available information and may be changed or updated without notice. The tour will depart Australia on September 6 and return on September 23, following the Cup final race and presentations on September 22. Depart Australia, arrive San Francisco. Coach transfer to hotel. Evening special welcoming reception. Coach transfer to viewing area for first day of 34th America’s Cup Finals. * Monterey and Carmel day tour. Other tour features and highlights will be announced as the tour departure date draws closer, and RRP is from $3800 per person. www.wodongatravel.com.au or phone Susanne Sharp on 1800 247 946. Top photo: Millions of dollars are invested to win the Auld Mug trophy. 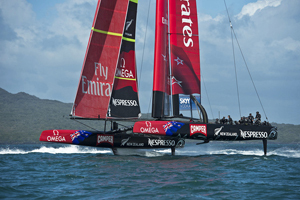 Five teams are challenging for next year’s America’s Cup in AC72 trimarans, including Emirates New Zealand. The America’s Cup defender is Oracle Team USA.